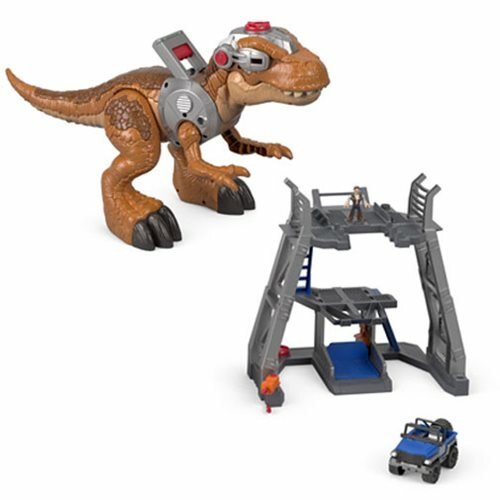 You control the action with this Imaginext Jurassic Rex! Send her rampaging with awesome lunging and chomping action! Features color-changing eyes that dilate and a mouth that glows red. Launch the included ATV so Owen can chase the dinosaur! You control the action with this sensational Jurassic World: Fallen Kingdom Imaginext Jurassic Rex Figure. Break the dinosaur loose from the holding base, pop open the blindfolds, and send her rampaging forward with awesome lunging and chomping action! This dangerous dino has color-changing eyes that dilate and a mouth that glows red when she's enraged. With a turn of the Power Pad, the included ATV launches as Owen races after the dinosaur. Can he get the Jurassic Rex under control? That's for you to decide! Imaginext - Imagine What's Next!